Mastervolt is your ideal system supplier. The products we supply fit seamlessly together and communicate easily to ensure a top system performance. Optimal operation is also provided by Mastervolt’s in-house developed communication and network platform: MasterBus. Save on installation time and costs. MasterBus is unique for the way a wide range of products, recognisable by the MasterBus symbol, are fitted with the same communication port. This results in a mine of information on all connected components. Everything becomes clear and easy to operate via one central touchscreen panel. Operation from multiple locations is also possible, for example via PC/laptop or SMS. Installation is also incredibly simple and the minimal amount of cabling significantly reduces the chance of failures. Thanks to galvanic isolation, nearly all Mastervolt devices can supply power to the MasterBus, ensuring a safe and stable network. Each MasterBus product has an ‘intelligence’ of its own and can function independently. 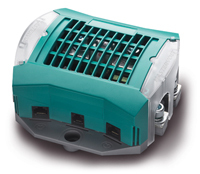 This feature reduces the dependency of individual products and enhances the overall reliability of your system. New equipment can easily be added to your existing MasterBus network by simply extending the network. This means the MasterBus network has an enormous degree of flexibility, not just today but also in the future. Moreover, Mastervolt supplies various interfaces with which you can also connect equipment that does not have a MasterBus link. For example, we supply the MasterBus NMEA 2000 Interface for the integration of navigation equipment. MasterBus is a network that makes use of CANbus technology, which already has a proven track record in the automotive and maritime markets. 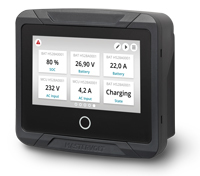 MasterBus controls the supply for all connected equipment, including the inverter, battery charger, generator and much more besides. This makes an intelligent system performance possible. A practical example: The generator is instructed to start automatically when the batteries are almost empty. MasterBus makes an electrical installation far less complex by reducing the number of cables. Each system component has two MasterBus communication ports. As soon as two or more devices are connected to each other via these communication ports they form a local data network - what we call a MasterBus network. As this requires very few communication cables you enjoy considerable savings in space, material costs and installation time. The MasterBus USB Interface allows you to monitor, control and configure the entire MasterBus network from a Windows PC or laptop. The galvanic isolation of the interface ensures you safe operation in all situations. The required MasterAdjust software can be easily downloaded here. Mastervolt offers various control panels (touchscreen and otherwise) for the display and operation of the connected equipment, giving you a complete overview of the status of your electrical system. Control is at your fingertips and the full colour EasyView 5 panel allows you to read all information on one central panel. All control panels are suitable for the display, operation and configuration of all connected MasterBus devices. Communicating via your cell phone is no longer a pipe-dream. Using MasterBus you can request information and control onboard equipment via SMS. If desired you can even set the interface to inform your cell phone when an alarm goes off onboard.